Miniature Schnauzers have an overall alert, robust stance—much like their cousins, Standard Schnauzers. They have small, square frames with long heads bearing bushy moustaches, beards and eyebrows. They have oval-shaped eyes, strong muzzles and V-shaped ears that bend forward. Their tails, sometimes docked, are carried high. They come in solid black, salt & pepper, silver & black and sometimes white. Having a Miniature Schnauzer can almost be like having a child—but in a good way. They are alert, perky and playful, but they need guidance to learn manners and obedience. The more you give—whether playtime, constructive games or good old-fashioned attention—the better they get. They love to feel involved in family occasions and will make trouble if they feel ignored. Highly intelligent and easy to train, Miniature Schnauzers nevertheless have a fearless streak. Often, they will go up against much larger dogs. And as they grow older they get more territorial. They will bark when they sense a threat, but Miniature Schnauzers are not prone to random or excessive noise. The ideal guard dog, their bark is much worse than their bite. Miniature Schnauzers are high-energy dogs. Without lots of exercise and activity, they can go a little stir-crazy and buggy and mischievous. Miniature Schnauzers, if neglected or not sufficiently exercised, can become destructive or get into other types of trouble. Miniature Schnauzers need to be brushed regularly to avoid matting. You might want to occasionally trim their beards as well. These dogs, to look their best, will need regular professional grooming. A healthy Miniature Schnauzer can live as long as 15 years, aging gracefully. Relatively healthy, they can sometimes develop eye problems, kidney stones and diabetes. The Miniature Schnauzer originated in 19th-century Germany. Originally intended to keep rats out of barns, they were derived from a mix of Standard Schnauzers, Affenpinschers and possibly Miniature Pinschers. The first Miniature Schnauzer on record appeared in 1888 and their first exhibition came in 1889. 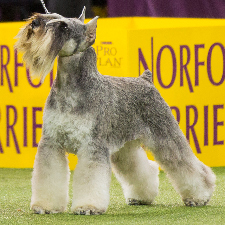 They began to be bred in the U.S. in 1925 and in 1933 the American Miniature Schnauzer Club was formed.